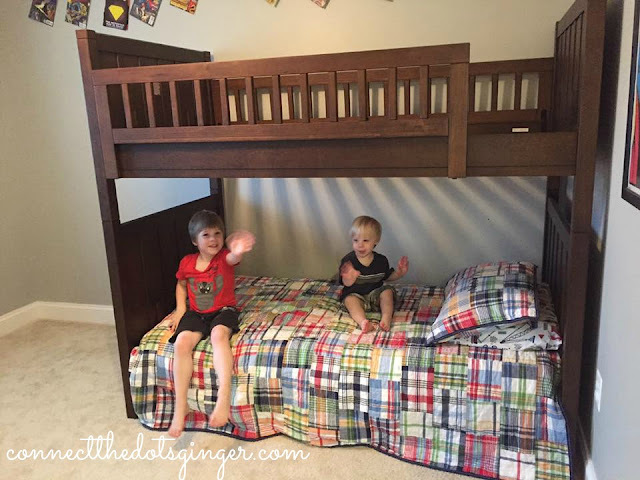 We are now going on 3 full weeks of our boys sharing a room full time! I have been imagining this for years you guys! My two boys sharing a room and then the other room for our little girl. Now that Collin has moved into Mason's room full time I get to start working on baby girl's room! SO EXCITING...but onto what this is really about. 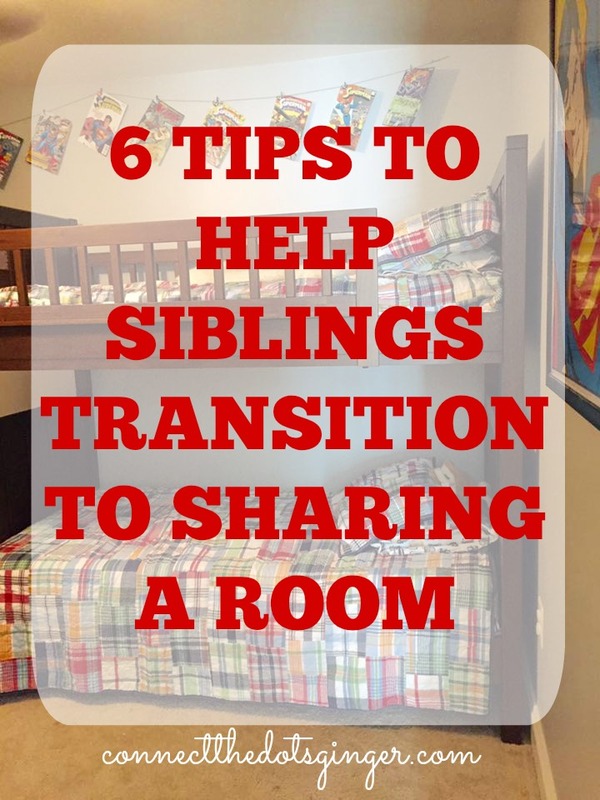 How to transition siblings to sharing a room. Mason is 5 next week and Collin just turned 2. To give you an idea on their ages. Collin moved out of our room as a newborn at 3 months because he could not stand being in a room with us. He actually slept better in his own room than in the room with us. Frankly, we all slept better. It was amazing. Considering that it took me 8 months to get Mason to sleep ok in his room by himself. 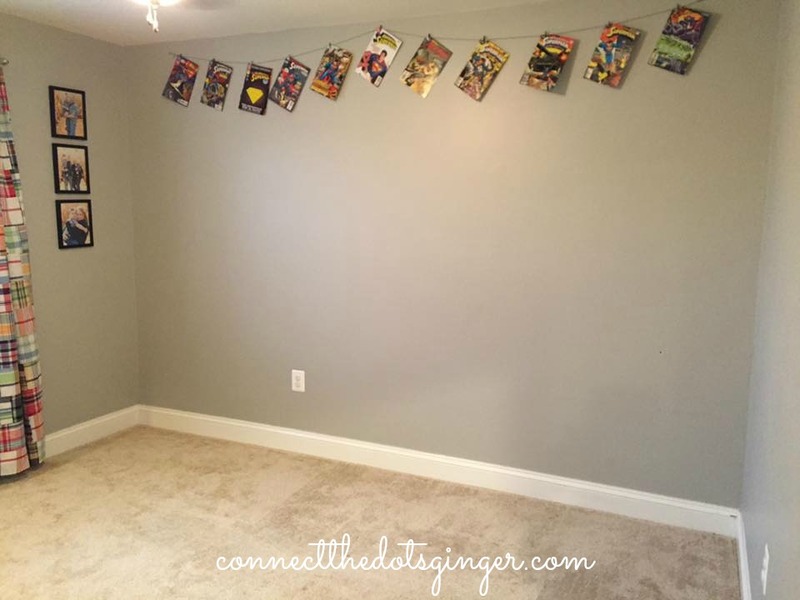 I had been really nervous about putting the boys in the same room for this reason. A few weeks ago we had a really bad and noisy thunderstorm and Collin was so scared to go to bed. It was 9:30pm and hour and a half past his bedtime and he was just screaming when I said it was time to go to bed. 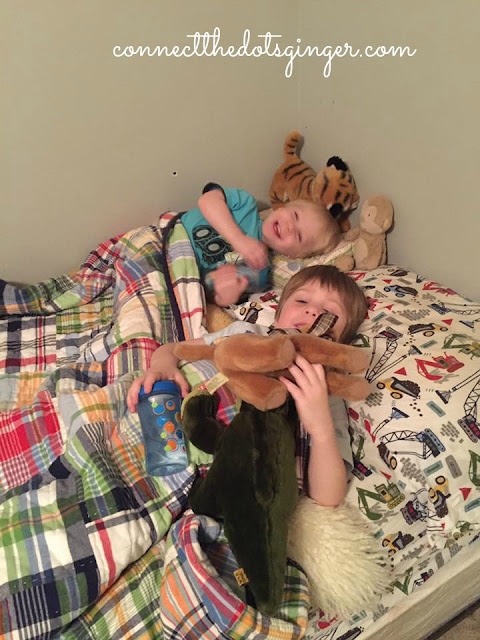 Mason had been asking to have a sleepover with Collin in his bed. I was hesitant because I didn't want Collin to get squished against the wall or fall out of bed. But I gave in because Collin was so excited when I asked him if he wanted to sleep in Mason's bed. Collin climbed right up and giggled and had a huge grin on his face (see above picture). It was too cute! And Mason was so excited too! That was the first night of them sharing a bed/room. For the next 2 weeks Collin continued to sleep in the bed with Mason, and taking naps in his crib so he could actually get some sleep during the day. It was crazy but it actually worked. The boys sharing a bed. Collin actually getting some sleep. The down side, they were up by 6am every morning without fail which is really too early for Collin, considering he was sleeping in until 8:30-9am everyday before that. Oh We had already ordered the bunk bed and just were waiting for it to be delivered. After a 3 long weeks of waiting for the bed to arrive it did! And it was put together in less than 30 minutes. It was amazing. 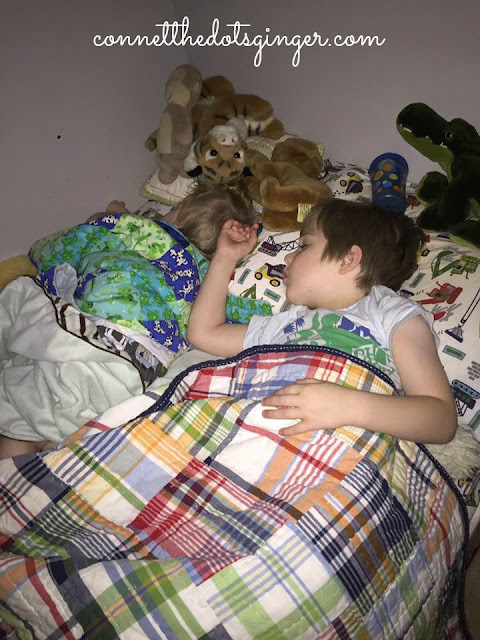 We hadn't planned on Mason sleeping on the top bunk until he was 5 and even pushing it longer because I didn't know how Collin would react to Mason being on the top bunk. But after a week and a half we decided, that the change needed to be done. Collin was becoming dependent on Mason being next to him to sleep. So we ordered our new Hyphen mattress for Collin on the bottom bunk and 6 days ago, the boys started sleeping in their separate bunk beds. Has it been easy? NO! Collin was very dependent and didn't understand why Mason was above him. And Collin wanted to be up there with him. 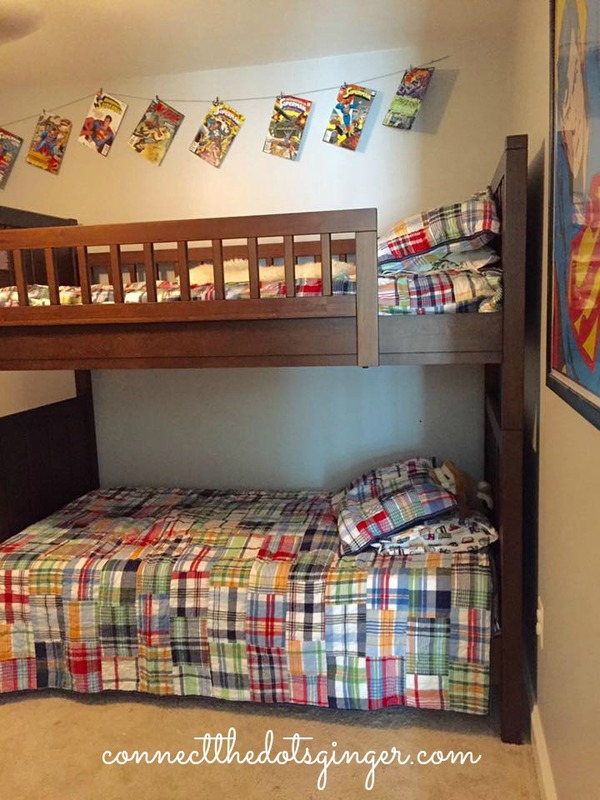 We also do not have the ladder attached to the bed. Collin has already tried to climb up it, and for his safety we only pull the ladder out for Mason to climb up to the top. Mason knows how to get down safely without it. (and up, but not every time, unless he really wants it, then he can get up every time.) Collin still wants someone to cuddle with him as he falls asleep, and I did that for 2 nights, then decided he needs to get used to this. We have had to be more flexible and talk to him about it. We are doing things to make sure that they are really tired before they go to bed. And that helps. All of you might be getting less sleep because they won't go to bed exactly when you want them too. Having too much fun talking or playing quietly. Plus they wake each other up, and waking up earlier in the day then they and you are used to. They are ready to play together first thing in the morning and they won't be afraid to let you know. We have had early wake up times as early as 4:30am. I have to talk to them and tell them that the sun isn't awake and they can't be either. And send them back to bed. But they don't want to...They want to play. We have made sure to do a big play time or walk before bed to wear them out. Then we have to get them ready for bed with potty, brushing teeth, prayers and then I sing a few songs for them. This seems to calm them down. And we are trying to stick to this schedule every night. We added in the walk and singing for them. We now have to turn off the light at the fan because Mason would get up and flip on the switch and wake Collin up if he had to get up to go to the bathroom. Collin would come in our room crying and mad because Mason woke him up. Understand that they are learning the new routine. And Collin, sometimes he doesn't like to go in his bed and he escapes. Just keep talking to them. Encouraging them to stay there and why it is so great! For safety, we do not have the ladder, and we have to explain all the time why to Mason. It's for the safety of his brother. Another new rule, if Mason wants some alone time he can now escape to his bed, which is out of reach from his brother. Same with Collin. I tell him, that his bed is a safe zone and that if he needs a break he can go sit and play or rest on it. Change is so hard for kids. They do not like it, as much as they act like they do, they don't like change. 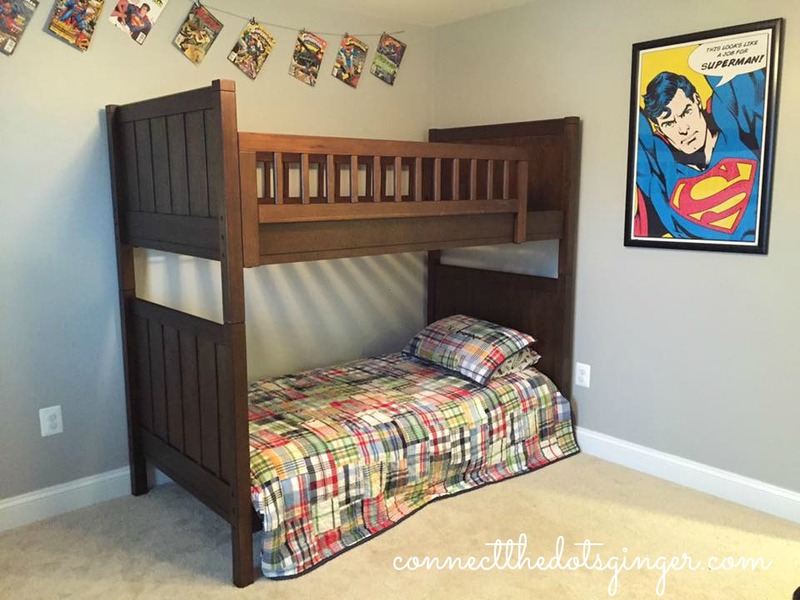 Make sharing a room the coolest thing since sliced bread. Congratulate them for sleeping in their bed. Be overly excited that they slept through the night. Make it fun for them and something that they look forward to. 6) Keep something the same. With the sibling moving into the room, trying to bring something from his previous bed into the new bed so that it is familiar. It is so easy to just go straight into new bedding and a new setup, but you really have to ease them into it. Collin and Mason both sleep on a sheepskin blanket, so that was in there, but I also pulled Collin's favorite two blankets and his small pillow from his crib. It took about 3 weeks before we could transition to his big boy blankets without him wanting his other blankets. And he was so excited to get his big boy pillow. It is an exciting thing for siblings to share a room! They have a friend to be around, as much as the other one might not want it, or act like they don't like it, they really do. Hang in there and before you know it, they will be sleeping soundlessly!